Art fresh out of the UK, Puppy-licious is "modern wall candy for your space". 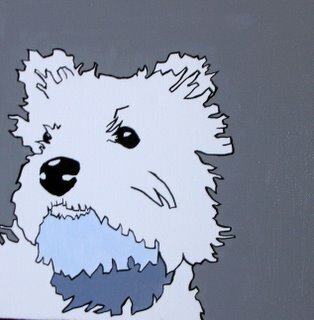 All paintings are acrylic on chunky canvas and original works of art. They'll also accept commissions (maybe they'll paint your pet?). The vibe is happy, funky, fun and 99% puppy love (I spotted a cat named Nancy in the mix). I dig the colors and think the close ups are very here + now. I like the "Gentlemen's Collection" with the grey tone backgrounds. Benson is adorable. How much is that doggy in the window? 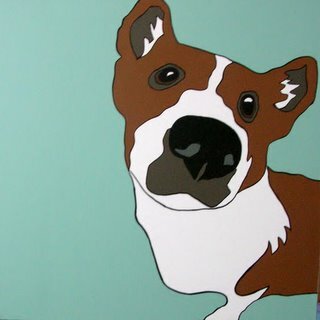 Their prices are listed here or you can email Puppy-Licious for a quote on any of the works you see on their website. They accept paypal, too. Do you like them? Woof! If you fancy cats more than pups, look for their new kitty-licious line - coming soon!